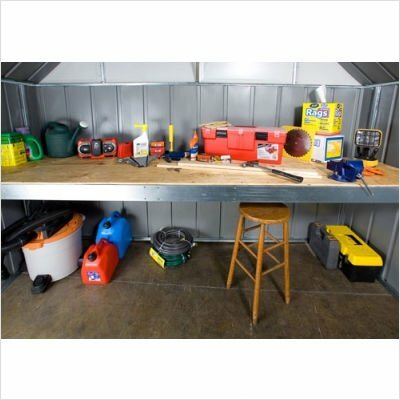 Add 25-square feet of storage to your arrow shed with the AT101 attic frame/workbench kit. This versatile accessory fit any 10-feet. Wide arrow building e by cept the homestead and utility building. The kit is adjustable to any of 5 heights for use as an attic or workbench frame. Plywood is a suggested finishing material not included. The frame holds up to 250-pound evenly distributed. Made of durable galvanized steel. All hardware is included. If you have any questions about this product by Arrow Shed, contact us by completing and submitting the form below. If you are looking for a specif part number, please include it with your message.